henever two or three pilots are gathered together around the nations capital, whether it be a Congressional hearing or just in the back of some hangar, youll probably hear the name of Ron Hubbard mentioned, accompanied by such adjectives as crazy, wild and dizzy. For the flaming-haired pilot hit the city like a tornado a few years ago and made women scream and strong men weep by his aerial antics. He just dared the ground to come up and hit him. In the beginning, Ron (also known as Flash) hailed from out west, but only stayed long enough to be born. Since then he has been a dweller of the world at large, and there are few nooks and corners of the earth that he hasnt poked into. Before he fell from grace and became an aviator, he was, at various times, top sergeant in the Marines, radio crooner, newspaper reporter, gold miner in the West Indies, and movie director-explorer, having led a motion picture expedition into the south seas aboard an ancient windjammer. Then he turned to glider flying. And that is what gave Washington its biggest thrill, for Ron could do more stunts in a sailplane than most pilots can in a pursuit job. He would come out of spins at an altitude of thirty inches and thumb his nose at the undertakers who used to come out to the field and titter. Once he took a glider up at a Chicago airport which was surrounded by a concrete road. It was a hot day and waves of heat were rising off the road as if it had been a stove. Ron sat on that up current of air and stayed there. Round and round the airport he went like a merry-go-round, until everybody got dizzy from watching him. Finally, he got tired of chasing his tail and came down, after establishing something of a record for sustained flight over the same field. Then, one day he got fed up with gliders and decided to try something with power. So he climbed into a fast ship and, without any dual time at all, gave the engine the soup and hopped off. Well, he got back on the ground with the plane still all in one piece and, going on the theory that its a good landing if you can walk away from it, he realized that he was now a pilot. Fired by his new prowess, he immediately started barnstorming and ensnared many an unsuspecting passenger. He flew under every telephone wire in the Middle West, and cows and horses in that section still shy at the sound of an airplane motor. 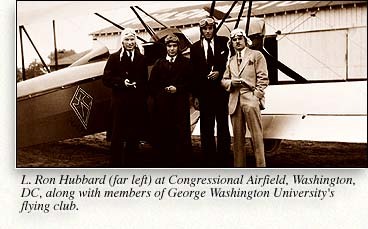 After being one of aviations most distinguished hell-raisers, he finally settled down with great dignity and became director of the flying club at George Washington University. At present, our young hero is buzzing around on the West Coast, where he writes magazine stories between flights. He is now recognized as one of the outstanding glider pilots in the country.